Cross Street Partners, located in Baltimore, specializes in adaptive reuse of historic properties, brownfield remediation, sustainable design and building practices, and transit-oriented development. With a knowledgable team of construction, development, financial advisory, and property management experts, Cross Street Partners is a powerhouse in Baltimore’s development world. 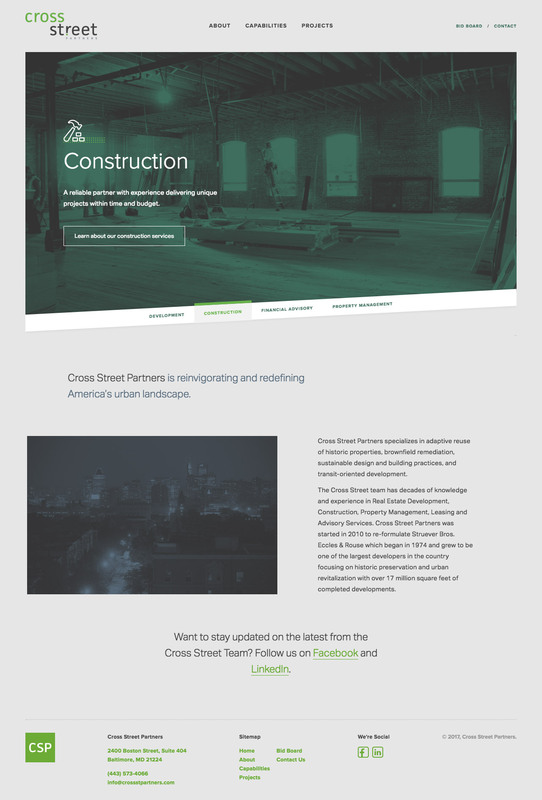 Cross Street Partners reached out to YDI looking to refresh both their brand and web presence. The new branding introduces a new color scheme and clean-cut logo that plays with hierarchy. Secondary logos allow the brand to work across a variety of sizes and uses. Cross Street Partner’s new website gives an extensive look at their impressive portfolio. The brand is expanded upon in the new design by incorporating patterns and gradients alongside clean typography to deliver a tailored experience for users. The custom-built WordPress template allows the client to update and add content across their website with ease.